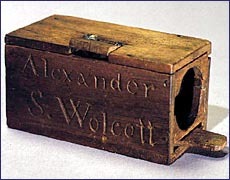 Today in 1840, to Alexander S. Wolcott received the first U.S. patent (No. 1,582) for a photographic invention for his “method of taking a likeness by means of a concave reflector and plates so prepared that luminous or other rays will act thereon.” A few months earlier, he opened the first commercial photography studio in New York. This entry was posted in Patents, Photography, This day in information. Bookmark the permalink.